Xiaomi is preparing a gaming-centric device under its newly acquired Blackshark sub-brand to take on the likes of Razer Phone. 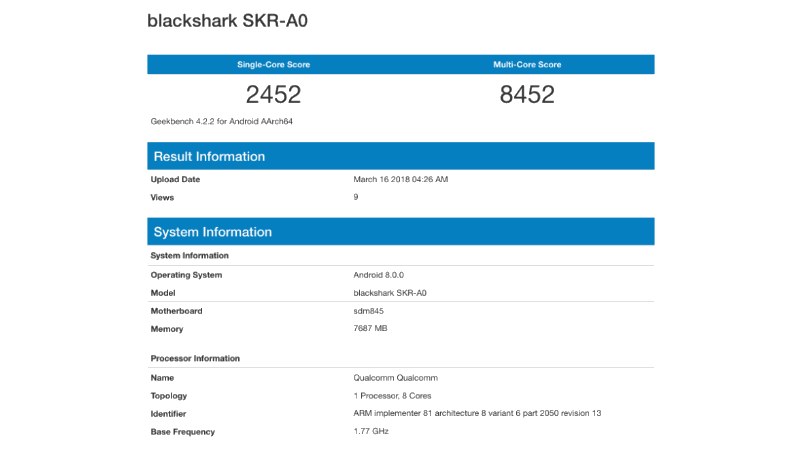 Today, the same smartphone with model number blackshark SKR-A0 paid a visit to Geekbench benchmarking site, revealing the key specifications. The yet-to-be-launched smartphone will be powered by the top-of-the-line Qualcomm Snapdragon 845 chipset, which will work in tandem with 8GB of RAM. Also, the phone will come with Android 8.0 Oreo out of the box. These features were leaked earlier as well. The phone managed to score a decent 2452 single-core score and 8452 multi-core score. These scores are in-line with other Snapdragon 845 SoC smartphones such as the Galaxy S9+ and Sony Xperia XZ2. These features are tipped earlier as well, so there is nothing new. However, we now have evidence that Xiaomi is indeed working on the Blackshark device. But right now, we don’t have any evidence on when Xiaomi is planning to launch the device. Earlier, the smartphone was spotted on AnTuTu benchmark and achieved a score of 270680. It’s also rumoured that this Blackshark gaming device from Xiaomi is rumoured to pack a 120Hz display, same as the Razer phone. While Razer brought this technology for the first time to a smartphone, this year, we could see many smartphone brands adopting this including Xiaomi and a couple of other Chinese brands. Furthermore, the Blackshark smartphone is also said to come with a dedicated cooling system to deliver great performance by keeping the device cool all the time. Also, Xiaomi is claimed to use a digital signal processor (DSP) in the smartphone to deliver best-in-class performance. Besides Xiaomi, Razer is also rumoured to be working on the second-generation Razer phone with this year’s flagship chipset on board. Xiaomi might use stereo speakers on this device as several reviewers in the world rated the Razer Phone as the best speaker smartphone. Expected launch – June? The phone looks promising. Might be Possible that High End Phones don’t support microSD Card slot because they (OEM’s) don’t want to hamper the customer experience due to the sake of external storage as it might slow down the Device. What do you think?